"Love the concept, it's a fun theme done well." Have a question for QT Gold Coast? "Free wifi and parking , good sized rooms, three bars to go to and nice breakfast restaurant , coffee area ." "Great location, close to restaurants and the beach." "Everything is clean and tidy." 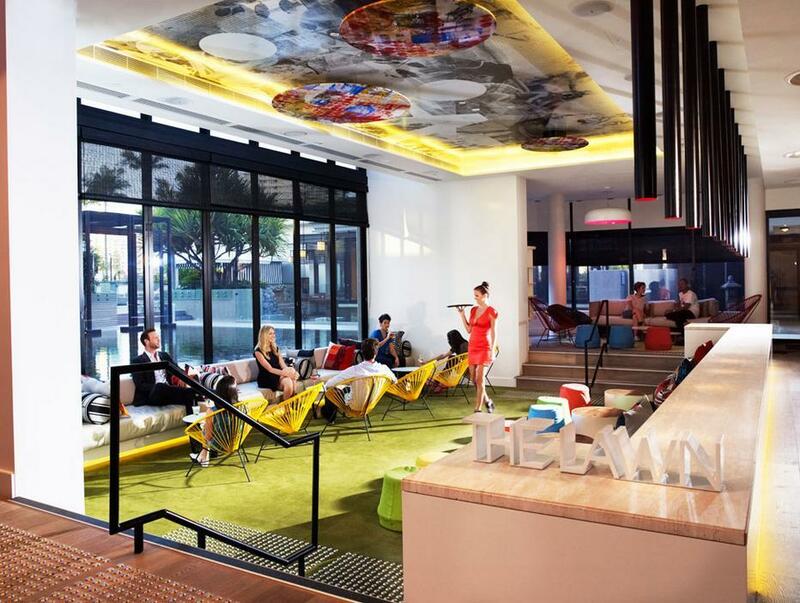 QT Gold Coast is situated in Surfers Paradise and features both hinterland and ocean views. The rooms feature a modern feel with plasma televisions. 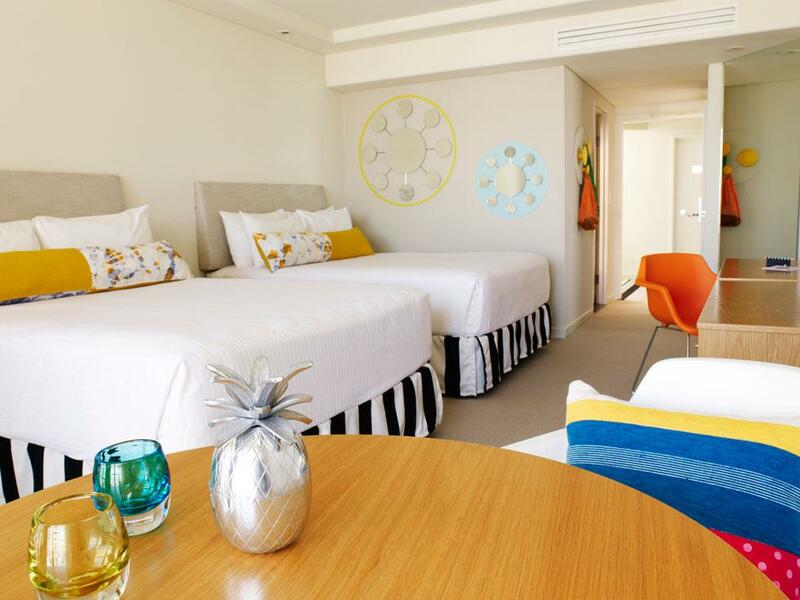 The 296 well appointed and renovated guestrooms come with their own private balconies, providing an excellent vista and the best of Australia's favorite holiday destination. For some of the best dining in town, head to the property's buffet-styled restaurant. Later on, head to Stingray bar for a stylish drink. Much can be done in the area with Surfers Paradise Mall, SkyPoint Observation Deck, and Main Beach all within walking distance. Please enter your preferred dates of stay and submit our online booking form to make a reservation at QT Gold Coast. "Was a great hotel to stay in with lots going on." The property does not accommodate Schoolies unless accompanied by a parent in the same room for the total duration of stay. Was a great hotel to stay in with lots going on. The outside area was a breath of fresh air, great music and very relaxing. Room was really clean and funky. There is also a balcony which is wonderful if you don’t like AC. Staff were exceptional and I would definitely stay there again. Don't think this hotel should be rated 5 stars. It feels more 3 or 4 star to me. Rooms were basic, with cheap-like furnishing, nothing fancy either. Would be suited more for a quick holiday stay than for a business traveller. Staff could be friendlier. Good selection of food for breakfast though. One of the best hotel experiences I’ve had in a long time. The restaurant is on another level compared to other hotels I have stayed in and the free bikes were awesome to get around on. My only gripe would be the bed was uncomfortable apart from that really enjoyed it. Nice decor and some interesting nooks crannies and retro items on display. Easy walk to beach and centre of Surfers Paradise. Friendly helpful staff. Lobby area and bar are very nice with a good vibe. Swimming pool on the small side. Rooms are stylish, spacious and have a fresh look. 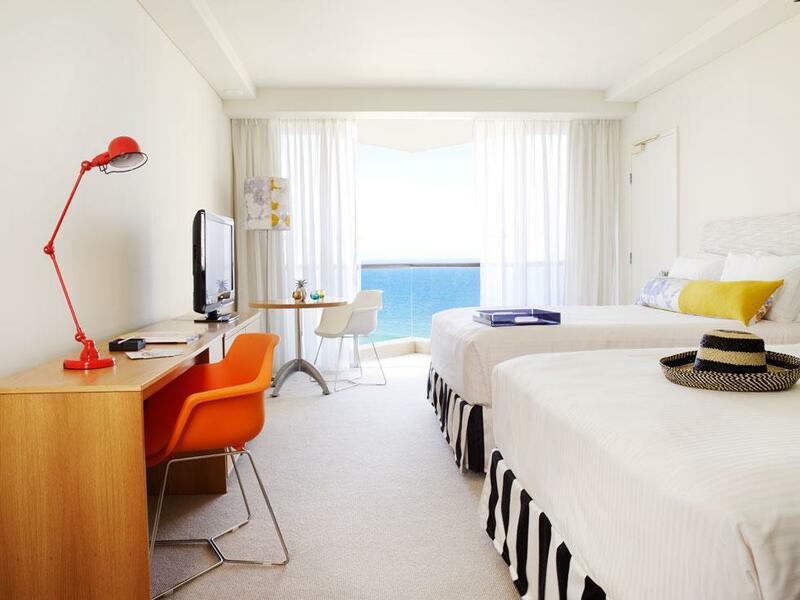 Hotel is one block from the beach and 2 blocks from the action of Surfers Paradise. Buffet breakfast is too expensive. Upon arrival was told I was upgraded to an ocean view room. This was awesome and the view was great from the bedroom. The room was clean and spacious for two people. I liked the bar in the pool area, however the pool was a bit small for the amount of people in it. The pool area cause also use some TLC but was still enjoyable. The location was good, less than a ten minute walk to the heart of surfers but wasn't too close that it was overly noisy. The beach was so close only two streets away. Had room service one of the nights and it was pretty good. The bed was comfy however it was a little bit squeaky. Overall it was a great stay and would definitely come back for the price I paid. Thanks QT! Within walking distance to the heart of Surfers Paradise and close to tram access as an alternative. Friendly staff, parking for the car costs $8 per night. They have a good live band at the lounge - overall, wonderful stay! A bit of cool design and attitude sets this place apart. The room was spacious in the main room but tight around the entrance and bench area. Some aspects of the room could be freshened up and getting a bit worn. Bathroom floods when using the shower. Too much stuff around the mini bar to sell. Had a nice steak dinner in room service. Not cooked as requested but still good. Foyer area and cafe great in the morning and staff outfits are hot! Super comfy bed too. At the price I paid it's great value. Very well presented hotel and it looks like they went to a modelling agencies books to find their staff. The restaurants world bazaar buffet is fantastic and the bar is great for people watching. Will know doubt stay here again sometime. Amazing stay at the QT! I was traveling for work this time and I am hoping to go back for a weekend with my boyfriend. The breakfast is the best one I ever had, absolutely incredible with really any food you would imagine you would love to have for breakfast! The room was just perfect, spacious, stylish and comfortable with a wide range of amenities that made the stay so pleasant. I totally recommend it! Liked the resort feel to the place. Lobby looked so cheerful. Staff was excellent. Free parking and Free WiFi. Rooms were big and clean with a nice balcony. 10mins slow walk to Surfer's Paradise. Could not ask for more. This hotel is great value. Right in the heart of Surfers without being among the riff-raff of Cavill Ave. The decor is quirky and funky. The bed was super soft and very comfortable. The lighting in the room was a bit annoying - too dark. No lights over the full length mirror and not enough lighting in the bathroom. Would be nice to have a price list of the spa etc. in the book, rather than having to call each centre. Mini bar was the best stocked we have seen in a long time. Check in and out was very quick and easy, despite the business of the hotel. Staff were friendly and easy to deal with. We ate at Stingray, which was mediocre for the prices they were charging. Beers on tap were flat. Highly recommend paying for the undercover parking. They accommodated a 1pm late check out without charging an extra fee. Overall, highly recommend this hotel, thought I think it's more of a 4 star to 4 and a half star hotel. To start with the NEGATIVE: The price is a little high. The POSITIVES: Service was excellent, design and freshness of the place is outstanding. Great location. Its not right in the centre of Surfers, which is ideal, however walk across the road and 8min across the beach front and your in the heart of surfers! The bazaar restaurant on the second floor is the best food in Gold Coast (fresh produce and market style). Cocktails and wine bar has a great selection and fantastic atmosphere. WRAP UP: I would recommend!! This was a last minute decision (literally) as our flight to Sydney got cancelled. We booked it on Agoda and showed up 10 minutes later. The staff was wonderful and we were sorted out straight away. Fabulous hotel with a wonderful view. Would be a bit of a walk to nearby attractions but would rather spend more time just relaxing in the room. They had umbrellas in the room which was very sweet. Bed was extremely comfy and had a wonderful rest that night. Large clean rooms with large very comfortable beds. Large shower and clean. Really liked the décor, different from the usual. Had dinner at the buffet restaurant, great food, plenty of desserts. A bar downstairs, great atmosphere at night. Not far to walk to other restaurants, bottle shop etc. Would highly recommend. it is located 5-10 mins walk away from the main streets of surfers paradise. free flow of lemonade (yummy!) and iced tea were served at the main lobby. the staff were really friendly and helpful. rooms and toilets had nice designs, yet lack a little practicality - everything had a price tag at the mini bar (even coffee! ), the water boiler was the smallest yet i've seen, water was a little slow and there were not much space at the basin, and the balcony was just empty and dirty. with all that being said, those were not complaints, merely room for improvement. overall we were quite satisfied with our stay, breakfast buffet was nice, would consider staying again! i was a little discouraged looking at the outside of the hotel, very dated. but once inside the hotel, everything was fabulous - from the lobby, restaurants, rooms. except for one though - the balconies of the rooms. apparently when they refurbished the hotel, they did not beautify the balconies at all. balconies were dirty, old, and they don't even have chairs and table at the balcony. water was kind of slow in the bathroom. breakfast was lovely. overall, the stay was quite satisfying.